With the holidays creeping up on us (very fast!) an exceptional cookie recipe is a necessity. Holiday cooking, holiday cookie exchanges, holiday parties, 'bad' sweater parties are upon us....Yippee! Which means lots and lots of cooking, and of course, eating! Pumpkin, apple, peppermint, chocolate, and cinnamon, are among my favorite flavors of Fall/Winter, and part of the reason why I love the holidays so much! Mmmmmm, pumpkin lattes! Traditional holiday recipes are usually my go-to (see my Pumpkin Pie Recipe) but I also like to incorporate non-traditonal and easy recipes! These cookies are both! We had fresh lavender in our garden, and I threw some in. They came out fantastic, but if there is no lavender on hand, they are great without! Preheat oven to 350 degrees. 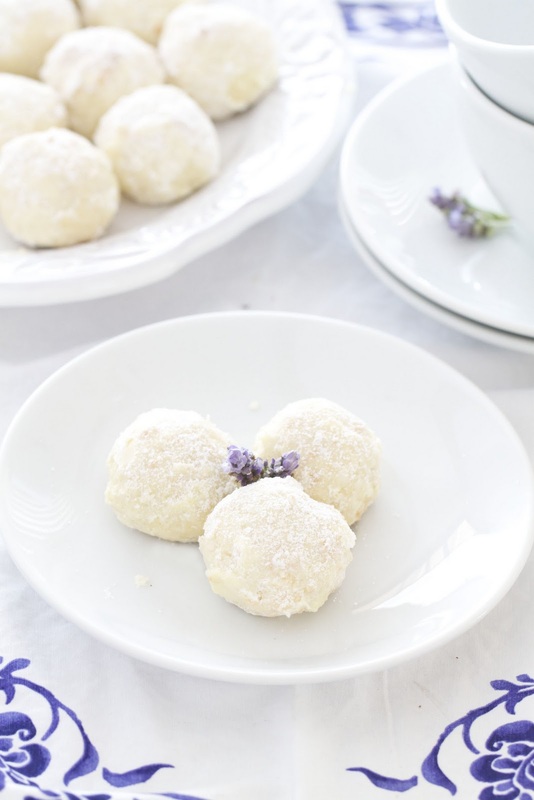 In the bowl of a standing mixer, using the paddle attachment (or an electric mixer) cream the butter and 1/4 cup confectioners' sugar on medium speed, until light and fluffy. Lowering the speed to the lowest setting mix in the flour and salt until they are well combined. Using a rubber spatula, stir in the coconut and lavender. Place a sheet of parchment paper on a baking sheet. Roll dough into 1-2 inch balls, spreading them about 2-inchs apart. Bake for 17-25 minutes (depending on size.) 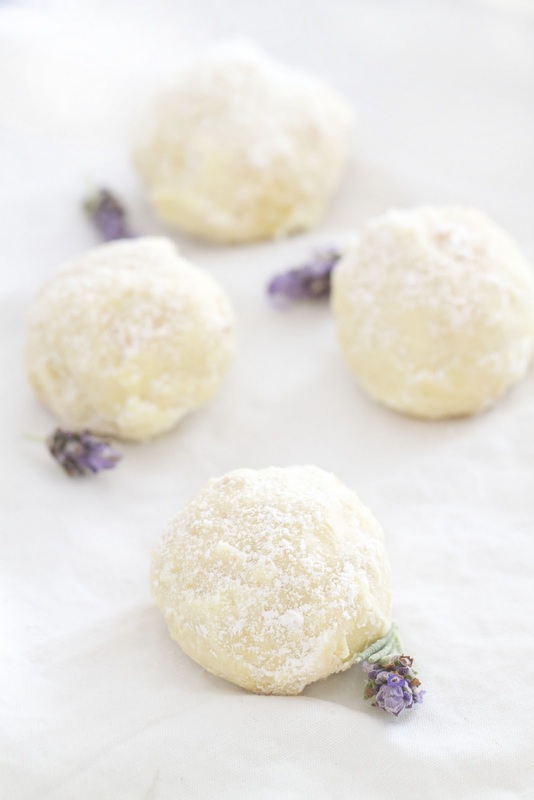 Roll the warm balls in confectioners' sugar, let cool. Wow, such an elegant treat. Love it! 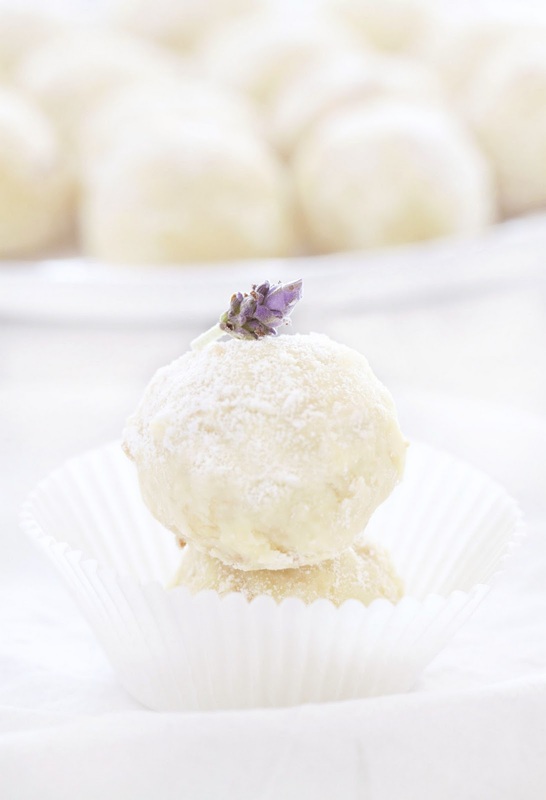 I bet the lavender and coconut jive so well in this cookie! Delicious! 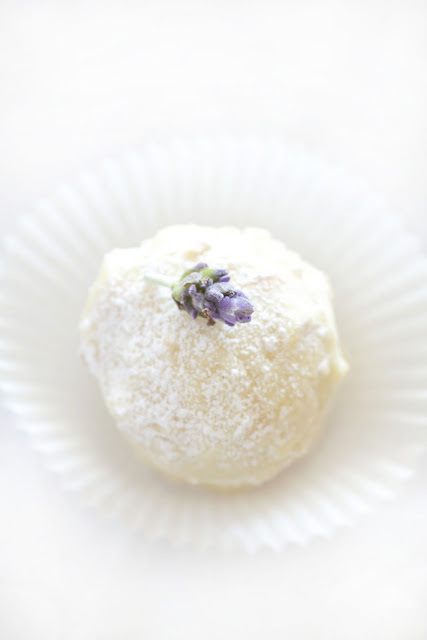 Wow - the lavender flower garnish is stunning placed against the pale yellow of the treat. These are fit to be served at the finest of events. Very impressive! Those look too beautiful to eat!! These look so beautiful!!! I love that they include lavender. I have some beautiful lavender I bought in Tasmania I am yet to use in baking. You've inspired me!! Your blog is so beautiful! Can't wait to see more. I made these and they were super yummy! These sound so simple to make and look so delicious! I just made them and they are yummy! Taking them for my holiday cookie exchange. Hi. I made these today and they were amazing. However, are they supposed to stay like a ball as they bake( like the pic)? Mine turned out flat like a cookie... What went wrong?! Thanks! !